Mobile Team Challenge equipment is being used in over 40 HMP, G4S and YOI establishments with excellent results and is being used in the following ways to generate more constructive and positive behaviour. MTC is seeing some outstanding results in its “Behavioural and Attitudinal Change” Programmes in Young and Adult Offenders. Whether the Group are looking to develop their Social Skills, such as; Respect, Self Awareness, Other Awareness, Empathy, Self Confidence or Self Belief etc or are preparing for resettlement , MTC’s principles and concepts are making a huge impact. One detention centre is measuring the offenders emotional intelligence behaviour in empathy and compassion and is charting the increase in the offenders empathy levels and HMP & YOI Parc have written a White Paper proving that the MTC interventions are reducing Re-Offending. For further information on how MTC can positively impact your Groups- in Schools, Colleges, Universities or Detention Centres please email us on info@mtceurope.co.uk and we will gladly forward to you further information. MTC Activities assists group functioning and development, which in turn improves the quality of group discussions about offending. MTC Activities provide many more opportunities for positive assessment, and often surprise individuals about their own and others capabilities and good nature. This can result in reversing the ‘labelling’ effect: damaging labels such as ‘troublemaker’ get replaced by more optimistic ones, which in turn builds self-esteem. Experiences of success in activities also helps to greatly develop self-esteem. This directly affects offending behaviour in which low self-esteem is almost always a contributory factor. The reviewing of positive experiences in activities helps to establish reviewing itself as a positive experience. Reviewing skills are then applied to offending issues so that significant changes in behaviour can be achieved. The reviewing of negative experiences which arise during activities also provides useful insights into difficulties that are related to offending. Activities can be used as part of the physical education programme, whilst also offering numerous development opportunities for enhancing thinking skills and developing more constructive behaviour. Creating a “winning attitude” upon successful completion of an MTC activity creates a “natural high” with the participants. Activities can be set up as skills training exercises. Improved skills in, for example, decision-making, problem-solving, planning, assertiveness, or self-control can reduce the chances of further offending. Choosing and introducing activities in ways that highlight connections with offending situations before doing the activity creates fresh insights so that alternative courses of action and possible solutions can be found. Doing activities with prison or police officers or other authority figures, can change attitudes all round. This can help to reduce offending and helps to avert or defuse any future confrontations. MTC Activities can help to develop better relationships between staff and offenders as well as amongst the staff and establishments target population. Taking part in MTC activities can be linked to easing the transition during the resettlement process. Conflict to Collaboration – This course is available for MTC Clients who have purchased the Conflict to Collaboration Upgrade Kit. Our success in these areas comes from our in-depth understanding of emotional intelligence and the 8 behaviours creating self awareness, and our appreciative inquiry coaching techniques. Accredited by the British Psychological Society, we use a short psychometric profiling tool to assess a person’s strengths in all 8 behaviours and this creates a 15 page assessment which recognises strengths and also identifies areas for development. Significant research in emotional intelligence in the U.S. amongst Prisons and Young Offender Institutes has seen that by researching the Emotional Intelligence of their inmates, they have found that molesters, rapists and murderers commit their crimes because their EMPATHY scores are low or non-existent – this is a proven correlation. dramatically. Previously, the offenders ‘utter lack of empathy’ for their victims led to them committing the crime but now their empathy for, and with others, has been developed, they are starting to feel remorse, respect, accountability … AND… EMPATHY for others. Restorative Justice is starting to work with the better understanding of behavioural and attitudinal change brought about by Emotional Intelligence experiential development programmes. Mobile Team Challenge is at the heart of these developments and we are seeing re-offending rates reduce in many areas, from Young Offenders to male and female adult inmates through exposure to Mobile Team Challenge experiential learning activities. Appreciative Inquiry facilitation looks at the appreciative – or the positive – and builds success stories from seeds of hope rather than from a critical and negative viewpoint. These experiences are applied and transferred to “life” and then we start to see the attitudinal and behavioural change in delegates. There are numerous articles which have been published recently regarding the impact or E.I. 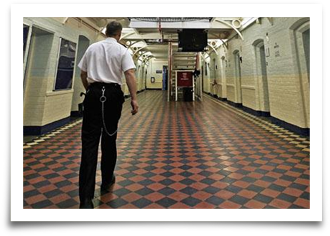 Training with prisoners please contact us for the very latest research information. The Home Office have provided funding applications for any Group or Organisation who develop programmes who can positively impact Hate Crimes, ‘County-Lines Projects’, Street and Gang Knife Crimes. MTC programmes are eligible for 100% funding in most situations and we have several joint projects where we are working with groups in partnership with the Home Office where lasting, behavioural and attitudinal change is making incredible impact in individuals and communities. Contact us now at info@mtceurope.co.uk to see if your project is eligible for Home Office funding or to enquire about a FREE, in-house, demonstration of these life-changing and life-saving concepts . According to theorist Daniel Goleman emotional intelligence is a combination of factors. It is the ability to know what you are feeling and managing those feeling while making good decisions. For example, being emotionally intelligent means “calming yourself when you’re anxious and handling your anger appropriately. It’s maintaining hope in the face of setbacks, having empathy and being able to get along with people” (Brown, 1996, para. 4). Several studies have shown by teaching prisoners these abilities and the skill to stop and think before they react resulted in fewer conflicts which are important for the safety of other prisoners, prison staff, and the public once released (Vacca, 2004, p. 297). With the rapid increase in offender populations and high rates of recidivism should an emotional intelligence training program be implemented to help reduce violence in prison and reduce reentry rates? In Nevada, approximately 24% of prisoners released reoffend within 36-months of their release date (Livingston, 2009, p. 20). The key to any prisoner’s success after release is determined by the offender’s ability to integrate back into the community and by avoiding further convictions after release. There have been several studies conducted on the effectiveness of educational programs and how they contribute to reducing recidivism rates. These studies have shown that prisoners who attend educational programs during their sentencing are less likely to reoffend after being released. Additionally, having the right kind of educational programs available will reduce prison violence, create a positive prison environment and reduce recidivism. Emotional intelligence training is important to the overall prison atmosphere because it will develop the prisoner’s self-awareness, self-regulation, motivation, empathy, and social skills which in turn will reduce recidivism (Livingston, 2009, p. 21). As Goleman points out in his book Social Intelligence (2006) the majority of prisoners seldom get to learn how to correct the behaviours and conditions that keep them repeating the cycle of release, relapse, and prison again (p. 293). This same majority suffer from a short circuit in their social brain which is essential in expressing empathy and for regulating emotional impulses. In the Nevada prison system approximately 25% of prisoners are under the age of twenty-five which in perfect for transforming this short circuit into a more law-abiding pattern. Evaluations of current prison rehabilitation programs have found that by targeting the younger and first time offenders is more successful in preventing future criminal activity after released and reducing recidivism (Goleman, 2006, p. 293). All educational programs in the prison system have one goal in common they all want to help offenders learn to be better people, not better criminals. Emotional intelligence training is the first step in this transformation (Goleman, 2006, p. 297). Goleman, D. (2006). Social intelligence: The new science of human relationships. New York, NY: Bantam Book. By Dr. Ira Katz, Clinical Psychologist and Clinical Supervisor, Department of Mental Health, Salinas Valley Psychiatric Program in Soledad, California. We have a population of severely psychiatrically impaired inmate patients with long histories of violent, self-injurious, or suicidal behaviours that have often led to disciplinary problems in prison. The majority have life sentences and/or have returned to prison over and over again. Typically for these patients, intense emotions of anger and dyscontrol build up and play out externally or internally. Externally means fighting with other inmates or staff. Internally means they decide it’s just not worth it anymore and attempt to harm themselves. So a major goal of our program is to address these emotions and behaviours so that the patients can be returned to regular prison or, for some, to life outside. In the case of most inmates who come into a prison psychiatric program, if you asked them what they would want to change about themselves, they’d answer, “I want anger management.” In reality, with the HeartMath techniques and also the Freeze-Framer® program, they wind up getting that and much more. They are getting in touch with their feelings and learning how to be in their heart instead of their head. As a psychologist, I believe that’s very important because when a person can feel, they can begin to heal. With the help of two assistants, I introduced the Freeze-Framer Interactive Learning System here in June 2003, and in one year, we’ve had over 250 male patients use the program. The majority of the inmates had very few skills to deal with their emotions in an appropriate manner, and this is largely behind the reasons that most are in prison. What the HeartMath System* has done in a fun, but definitely educational way is to give our inmates an opportunity to reduce their impulsivity, manage their emotions, feel their feelings, increase their behavioural choices, and be able to see their progress right on the computer screen. Patients like watching their heart rhythm waves change on the Freeze-Framer*, practicing downshifting from the head to the heart. They are really experiencing that shift and what managing their emotions feels like. One of the things that I think is so successful is not just the software, it’s the philosophy. The philosophy about using the power of feelings is so strong, when taught correctly, that the men continue using their HeartMath skills after their computer sessions are over. When the lights go out, many practice the Freeze-Frame* technique. They play anger games to practice managing their emotions, for example asking each other, “What makes you the most angry?” or telling each other situations where they have used the technique. I also give them exercises, for instance, a form that says, “Imagine this situation: somebody disrespects you, and you’re ready to knock this guy out. Hold that feeling; now down shift from 5th gear… shift it down to Neutral. Now let’s examine what powers and choices you really have to deal with this situation, using the Freeze-Frame* technique.” They also write down on cards the people they appreciate. If they’re having a bad day, they pull out their cards and start to transform their anger into something more suitable. We tend to measure the success of our program in the number of suicide attempts, the number of fights, and the number of self-injurious acts. I can tell you that in this last year we haven’t lost anyone to suicide and in terms of violence, there have been maybe five or six incidents in which someone got out of control, but no one got hurt. This is at a level of success beyond what normally occurs in a prison psychiatric program. In addition, of every patient who has been returned to life outside the prison, none has returned. 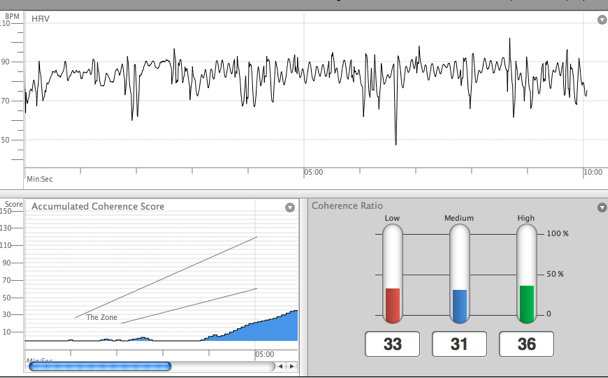 It will be a year or two before I can look at the results of using the Freeze-Framer program on a statistical analysis basis, however, I’m very pleased. I call this “hope for the hopeless” because men who’ve never really stopped long enough to feel their feelings are now realizing they can make choices, they can handle their feelings differently, and things seem to work better when they do. The HeartMath System* represents a really fresh approach to getting our patients engaged in taking more responsibility for their lives. Improved skills in decision-making, problem-solving, planning, assertiveness or self-control can reduce the chances of further offending. Enhanced thinking, personal and inter-personal skills. 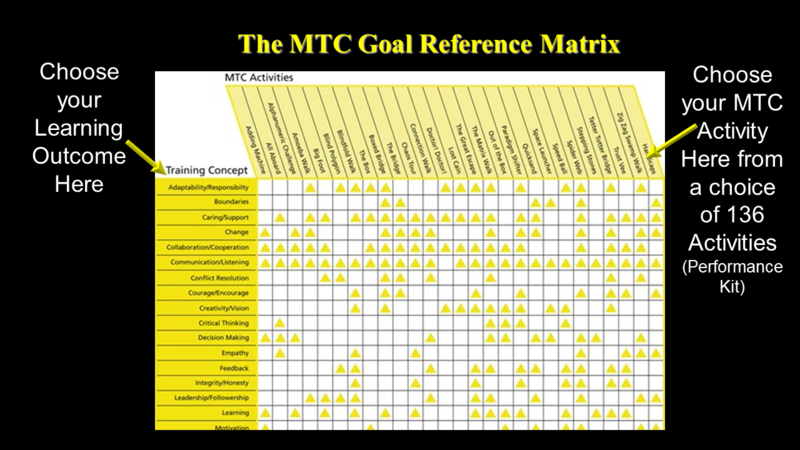 MTC Activities provide more opportunities for positive assessment. Greater levels of fitness and variety in Physical Education programmes. A growing number of organisations within HM Prison Service are using MTC effectively as part of E.T.S, S.O.T.P. AND CALM courses. This course is a “Train the Trainer” Course which enables the delegate to deliver E.I. training. Simply identify your preferred learning outcome for your Group and you will find several MTC experiential activities to provide you with the inspirational and motivational learning experience. MTC is one of the countries leading authorities in experiential learning with a proven track record. From Community Groups, Faith Groups and Churches to Scouts, Guides, CCFs etc, MTC offers a complete range of development programmes for Individuals, Teams and Organisations within the 3rd Sector.